APCARI > Blog > Good News Stories > Congratulations to first place winner Doug Brown! Congratulations to first place winner Doug Brown! Congratulations to PhD grad student Doug Brown for his First Place win at the 2018 University of Alberta Student Falling Walls Lab Competition! Doug’s First Place award also gains him an entry and an all-expenses-paid trip to the highly competitive and prestigious Falling Walls Lab Conference in Berlin, November 8-9, 2018! 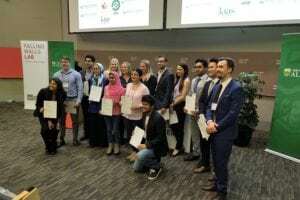 Fifteen student presenters pitched their innovative and globally-important research ideas in a short 3 minute presentation to a panel of science and tech-business savvy judges and a large cheering audience on September 19, 2018, at the University of Alberta in a high-stakes “TEDTalk” meets “Dragon’s Den” style. The competition was very strong but Doug gave an inspired speech on breaking down the walls of metastatic cancers using new lipid nanoparticle technology that he is helping to develop during his graduate studies in Dr. John Lewis’ laboratory. The Sept 19th UofA Falling Walls Lab competition will be featured on Global News on the evening of Sept. 20th, around 6:15 pm. Check it out! Doug will be taking his pitch to the Falling Walls Lab competition in Berlin, Germany this November where he will compete with many other inspirational students at this international event. 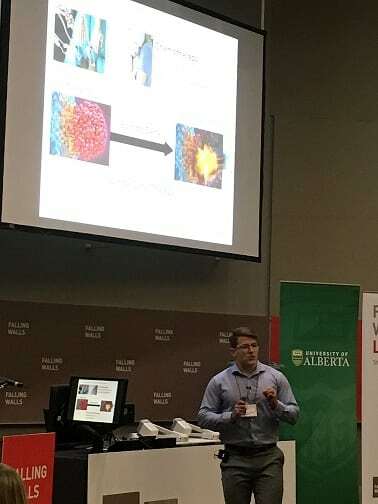 This is doubly exciting for the Lewis lab because John Lewis recently won the UofA Falling Walls Venture competition that was held on Aug 29, 2018 and he will be competing in the Berlin Falling Walls Venture! Good luck to both Doug and John at the Falling Walls Finale in Berlin!